The situation in Syria is reaching another critical point. There is an increased possibility of a large scale clash between U.S. and Russian forces. We had warned of such a clash over control of the rich fields east of Deir Ezzor. At least three incidents over the last days point to more significant escalations. On the 17th the U.S. accused Russia of a light air attack on its proxy forces north of Deir Ezzor. Russia denied that it had attacked those forces. 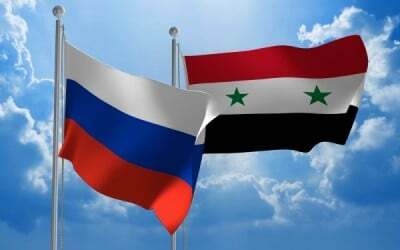 On the 18th and 19th large contingents of Russian and Syrian troops crossed the Euphrates at Deir Ezzor in east-Syria. The U.S. Kurdish/Arab proxy force in the area actively tried to hinder that movement. Today the Russian military accused the U.S. Kurdish proxies near Deir Ezzor of firing artillery on its forces. It threatened massive retaliation. The most dramatic incident was the al-Qaeda attack in Idleb. Al-Qaeda in Syria, renamed to Hay’at Tahrir al-Sham, currently controls Idleb governate and Idleb city in north-west Syria. On September 19 it launched a large scale attack on Syrian government positions in north Hama, south of Idleb provinces. The al-Qaeda forces gained significant grounds before being stopped and forced to retreat. Nearly all the heavy weapons, tanks and artillery, that al-Qaeda had in the area were used and in the attack. The spokesperson of the Russian military said (vid with English subtitles) that, according to Russian intelligence reports, al-Qaeda’s attack was made on behalf of the U.S. to slow down the Syrian-Russian campaign in the eastern province Deir Ezzor. A subtask for the terrorists was to capture a platoon of Russian soldiers. This is, to my knowledge, the first time that Russia made such a direct and extremely grave accusation against the U.S. forces and intelligence services in Syria. For 24 hours, insurgents managed to dent the government troops’ defence line for up to 12 kilometers in depth and up to 20 kilometers in front.According to the received data, this offensive was initiated by the US special agencies in order to stop successful advance of the Syrian Arab Army to the east from Deir ez-Zor. Seizing of a unit of the Russian Military Police was one of the main aims of insurgents. The Russian MP unit was operating in an observation post deployed as de-escalation observation forces. As a result, the MP platoon (29 persons) was blocked by insurgents. The encirclement has been breached. Units of the Russian Armed Forces have reached locations of SAA without losses. After the al-Qaeda attack was launched the Russian air force in Syria initiated a massive counter campaign over Idleb province. For the last 24 hours, aviation and artillery units have eliminated 187 objects, 850 terrorists, 11 tanks, 4 IFVs, 46 pickups, 5 mortars, 20 trucks, and 38 ammunition storages.Units of the 5th Airborne Assault Corpse launched a counter-attack and almost took [all] lost positions. Pictures from the area showed several destroyed tanks and infantry fighting vehicles. This was a very costly campaign for al-Qaeda with no significant gain. It seems that Syrian and Russian intelligence were aware that an attack was coming but not of the details. For a while the situation was extremely critical. Then the large aerial counter campaign caught al-Qaeda by surprise and destroyed the attacking forces. At the same time as the al-Qaeda attack in Idleb started U.S. proxy forces in east-Syria (yellow) took measures to hinder the fight of Syrian forces (red) against the Islamic State (black). The Syrian government forces are cleared nearly all of Deir Ezzor city of ISIS forces. At stake now is the control of the oil fields east of Deir Ezzor and north of the Euphrates river. “According to the reports that the Syrian commanders have been sending from the frontline, most serious counter-attacks and mass shelling on the Syrian troops come from the north,” he said. “It is the area where units of the Syrian Democratic Forces, as well as the US special operations units, are deployed, who, according to CNN, are providing medical aid to these militants instead of participating in the operation to liberate Raqqa,” [Russian Defense Ministry Spokesman Major General Igor] Konashenkov said. Water discharges from the Euphrates dams controlled by the US-backed opposition hamper the advance of Syrian government troops near Deir ez-Zor, Russian Defense Ministry Spokesman Igor Konashenkov said on Tuesday.”Thus, the water situation on the Euphrates has deteriorated dramatically in the past 24 hours. As soon as the Syrian government troops began to cross the river, water level in the Euphrates rose within hours and the current velocity nearly doubled to two meters per second,” he said. Russia warned a representative of the US command in Al Udeid, Qatar, that “any attempts of shelling from the areas where the militants of the Syrian Democratic Forces are based will be immediately curbed.””Firing points in these areas will be immediately suppressed by all means of destruction,” the general said. Fighters of the Syrian Democratic Forces approaching Deir ez-Zor from the north are easily joining IS terrorists, and Russian drones and reconnaissance recorded no clash between the IS with a “third force,” namely the SDF over the past week, he explained. However, massive fire from mortars and rocket artillery was opened twice on the Syrian troops from the areas on the eastern shore of Euphrates where the SDF fighters and servicemen of US special forces are based, Konashenkov said. The U.S. paid “Syrian Democratic Forces” that pushed into northern Deir Ezzor without meeting any resistance are mostly local tribes who were aligned with the Islamic State until the U.S. diplomat Brett McGurk hired them to fight on the U.S. side. They are led by Kurdish commanders and “advised” by U.S. special forces. The U.S. wants to keep Syrian government forces away from the oil fields north of the Euphrates. 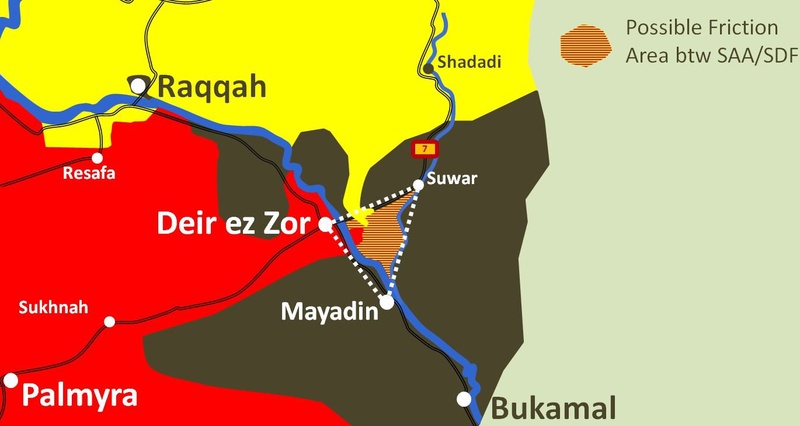 It has plans to build and control a Kurdish proto-state in north-east Syria and control over the eastern Deir Ezzor oil would give such a state the necessary economic base. 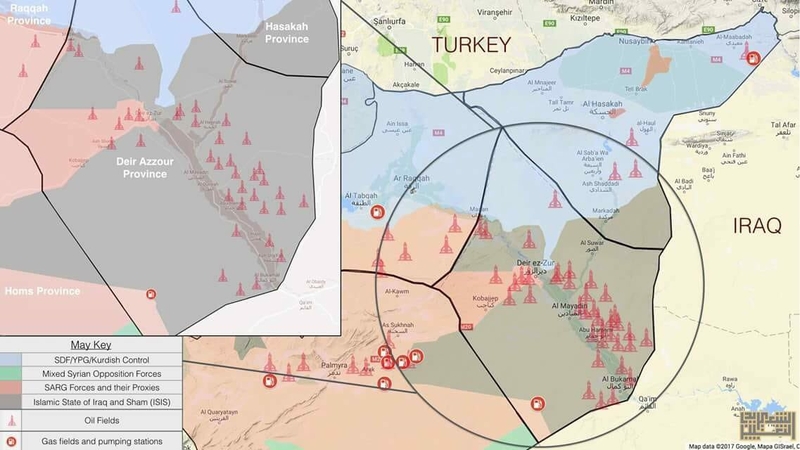 But the U.S. has too few proxy forces available to actually take the oil area away from the Islamic State. Only the Syrian army has enough resources in the area. The U.S. is now cheating, attacking Syrian-Russian forces, and rushing to get an advantage. According to the Russians the U.S. Kurdish proxies have even stopped the fight against ISIS in Raqqa and moved forces from that area to take the oil in the east. I doubt that Syria and Russia will allow that to happen without taking measures to counter it. With the al-Qaeda diversion attack in north-west Syria defeated and more reserves available the Syrian alliance should think about a fast air-assault on the oil fields. As soon as the oil wells are under Syrian government control and the ISIS presence eliminated the U.S. has no more excuse to continue the current deadly game.